Joe Lamantia has been an active member and thought leader in the information architecture and user experience fields since 1996. A veteran architect, consultant, leader, and designer, Joe has worked successfully in a wide variety of industries and settings including: for-profit and non-profit organizations, startups, interactive agencies, consulting houses, system integrators, product companies, and social media. In 2000, he became an entrepreneur and started his own company. Joe is the creator of the leading freely available tool for card sort analysis; a frequent writer and speaker on future directions in user experience, and the intersection of business, culture, design, and systems thinking; and author of the IA Building Blocks framework for portals and tile-based user experiences. Joe is currently based in Amsterdam. He tweets as @moJoe and blogs at JoeLamantia.com. Send recommendations on where to get a good bowl of noodles, or your favorite kind of hot sauce, to joe . lamantia [at] gmail.com. This story is the third in a series of articles sharing a design framework for dashboards and portals. Part 1 of this series, “The Challenge of Dashboards and Portals,” discussed the difficulties of creating effective information architectures for portals, dashboards, and tile-based information environments using only flat portlets, and introduced the idea of a system of standardized building blocks that can effectively support growth in content, functionality, and users over time. In enterprise and other large scale social settings, using such standardized components allows for the creation of a library of tiles that can be shared across communities of users. Part 3 now describes the Container components of the Building Block system in detail. The different kinds of Container blocks in the system play different roles, based on their relative size, in the overall effort to construct dashboards or portals. The smaller blocks–Tiles, Tile Groups, and Views–-enable the display of content, and support users’ interactions with content. Sections, Dashboards or Portals, and Dashboard or Portal Suites–-the larger blocks–enable the navigation, organization, and management of collections of content. Pages straddle the middle of the size continuum; they are the largest block whose role is primarily to provide a framework for display of dashboard or portal content, and the smallest building block which plays an important navigational / organization role in the system. The different kinds of blocks work in concert to enable the creation of a scalable, navigable, and maintainable information architectures that support high-quality user experiences. The Connectors (described in part four of the series, the next installment) ‘hold things together’; thereby creating navigation paths amongst destinations, establishing a tangible architecture or structure, providing referential cues for orientation with the environment, and allowing movement into and out of the environment. The different kinds of Containers work in concert with Connectors to enable the creation of scalable, navigable, and easily maintainable information architectures that support high-quality user experiences. Tiles are the fundamental building block of the dashboard or portal framework. Tiles locate content and functionality within the coherent information and navigation hierarchy of the larger dashboard or portal environment, while clearly identifying the sources and broader contexts of the information or tools they contain, and offering consistent access to convenience functionality such as printing and e-mailing the Tile contents for use outside the dashboard. Tiles consist of two required components–-a Tile Header and Tile Body–-and one optional component–the Tile Footer. Tiles may include multiple Control Bars (note: adding multiple Control Bars can quickly increase development complexity and lower usability levels). The Tile Header contains a mandatory Title, optional Subtitle, mandatory source indicator identifying the origins of the content, and may include buttons or links for Convenience Functionality (described in detail in a subsequent part of this series). The mandatory Tile Body can contain nearly any form of content. Tiles commonly contain text, charts, tables, interactive maps, scrolling news feeds, RSS consoles, video, slideshows, syndicated XML structured documents, links to documents and resources, and complex transactional functionality. Of course, this is only a small subset of the tremendous diversity of Tile-delivered content available in the rapidly growing libraries of widgets published for Apple’s OSX desktop, Yahoo’s widget platform, Google Gadgets, web desktops such as NetVibes, and the many social networking platforms including FaceBook and MySpace. In the end, the range of content that can appear within a Tile is limited only by imagination and ingenuity. The optional Tile Footer is a structurally consistent location for contextual links, pointers to related destinations and content. The Tile Footer commonly offers links to additional resources or source data in another format (tab delimited, .pdf, etc. ), links to other Tiles, Pages or areas of the Dashboard that provide related content or functionality, links to other applications and environments offering comprehensive functionality or information out of scope for the Tile, etc. The sizes and internal layouts of individual Tiles will vary depending upon several factors including, but not limited to their content, priority vs. neighboring Tiles or blocks, and expectations for reuse. It is good practice to define a grid for screen layouts that prescribes standard sizes for Tiles and all screen elements, and match the sizes and internal layouts of Tiles to this reference grid. Many of these interaction behaviors and design best practices are now offered as standard functionality–making them ‘free’ or ‘low-cost’ in design and development terms–by leading business intelligence and portal platform vendors. Additionally, these capabilities are also becoming standard in many general purpose presentation frameworks, including RUBY and AJAX libraries, and the various for-purchase (Adobe AIR, etc.) and open-source development toolkits. Stacking note: Tiles stacked inside larger building blocks retain their individual Tile Header, Tile Body, and any optional components. Figure 12 shows an example rendering of a Tile. This wireframe shows the structure of a Tile with an attached Control Bar. The Tile Header offers several types of convenience functionality (print, e-mail, and PDF export of the Tile). The Control Bar offers a single selector. The Tile Body contains a chart and table, each with a title and footer or key. The Tile Footer contains four links, to a mixed set of destinations. Tile Groups consist of two required components – a Tile Group Header and Tile Group Body – and may include an optional Tile Group Footer. Tile Groups may include multiple Control Bars (note: adding multiple Control Bars can quickly increase development complexity and lower usability levels). The Tile Group Header contains a mandatory Title, optional Subtitle, mandatory source indicator, and may include buttons or links for Convenience functionality. 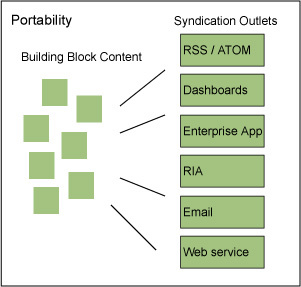 In this scenario, these two Tiles likely present information that comes from different data sources (perhaps one internal, and one licensed from a third party market metrics service), and different organizations that used the building blocks system to coordinate user experience design and development efforts that rely on a common enterprise portal or platform foundation. The consumers of the individual Tiles are likely affiliated with separate business units or operating groups, and may not need or be aware of the other Tiles, or the Tile Group. The consumers of the Tile Group could easily be part of a third element of the organization–or perhaps they are affiliated with the originating groups for the separate tiles, but share a common management perspective or performance incentive that requires a comparative presentation of the source information. Stacking note: Tile Groups stacked inside larger building blocks retain their individual Tile Group Header, Tile Group Body, Tile Group Footer, and any optional components. Design note: While Container definitions mandate some components to maintain the structural integrity of the building blocks system (always a Tile Header, etc. ), they do not mandate constant visibility or display of all the structurally required components. Excess chrome is the enemy of a good user experience at all levels of structure, and should be avoided. Many existing interaction patterns, control mechanisms and design principles can help eliminate excess chrome, and minimize the presence of chrome in general to that which is necessary for a high quality user experience, without increasing the effort or cost of relying on the building blocks. This wireframe illustration shows the structure of a Tile Group with an attached Control Bar. The Tile Group Header offers several types of convenience functionality (print, e-mail, and PDF export of the Tile as rendered). The Control Bar offers two selectors. The Tile Group Body contains two stacked Tiles; one Tile offering text, the other offering the combination of a chart and table seen previously. Note that both stacked Tiles retain their individual Tile Headers and Tile Footers. In this rendering, neither stacked Tile offers convenience functionality, though it is possible for stacked Tiles to offer convenience functionality. Views consist of two required components–-a View Header and View Body–-and may include an optional View Footer. Views may include multiple Control Bars (note: adding multiple Control Bars can quickly increase development complexity and lower usability levels). The View Header contains a mandatory Title, optional Subtitle, mandatory source indicator, and may include icons for accessing standard convenience functionality. A View typically combines Tiles and Tile Groups together to present a comprehensive set of information resources that address a single perspective within an area of interest. In common use, Views allow Dashboard or Portal users to see the most logical subsets of all available Tiles related to one aspect of an area of interest. For example, many Tiles might provide information about a single product–too many to appear on one Page–but the Customer View of a product presents only those Tiles that show information about a single Product in relation to major Customers. Another defined View could offer marketing information for that same product, and a third might allow executives to check inventory levels for the product at various storage facilities. Views stacked inside larger building blocks retain their individual View Header, View Body, View Footer, and any optional components. Figure 14 shows an example of rendering of a View. This wireframe shows the structure of a View with an attached Control Bar. The View Header offers several types of convenience functionality (print, e-mail, and PDF export of the View as a single unit). The Control Bar offers two selectors. The View Body contains two stacked Tile Groups, one Tile offering text, the other offering the combination of a chart and table seen previously. 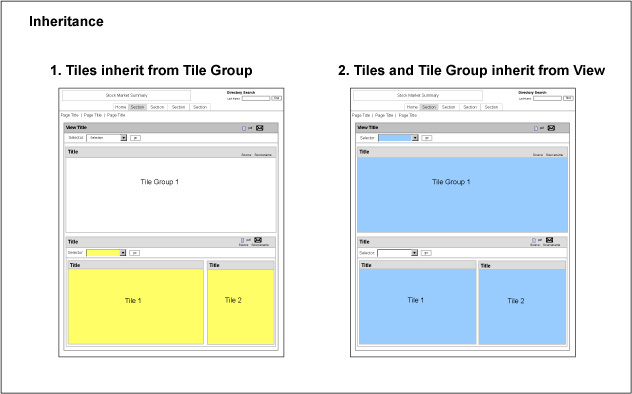 The stacked Tile Groups retain their individual Tile Group Headers, but do not include Tile Group Footers. In this rendering, neither stacked Tile Group offers convenience functionality, though it is possible for stacked Tiles to offer convenience functionality. The View Footer contains links to a variety of documents, applications, and destination sites. It’s best to talk about Pages in two senses; first as building blocks or Containers, and second as browsable destinations for users navigating dashboard or portal environments. In the first sense, as part of the hierarchy of building blocks in the dashboard or portal system, Pages are simply a larger kind of Container without mandatory components. They are governed by the same principles of portability, openness, independence, etc. as the other blocks, which means individual Pages may not be visible to some types of users, depending on security restrictions, and could consist of a mix of smaller building blocks and elements of free-form content. I considered calling them ‘nodes,’ to emphasize the distinction between their building block system role and their browser navigational role, but that felt too abstract. In the second sense, Pages take on their traditional role as presentation canvases for content and functionality, linked together by navigation mechanisms: they serve as the single-screen units of display and interaction familiar from the Web browsing paradigm. 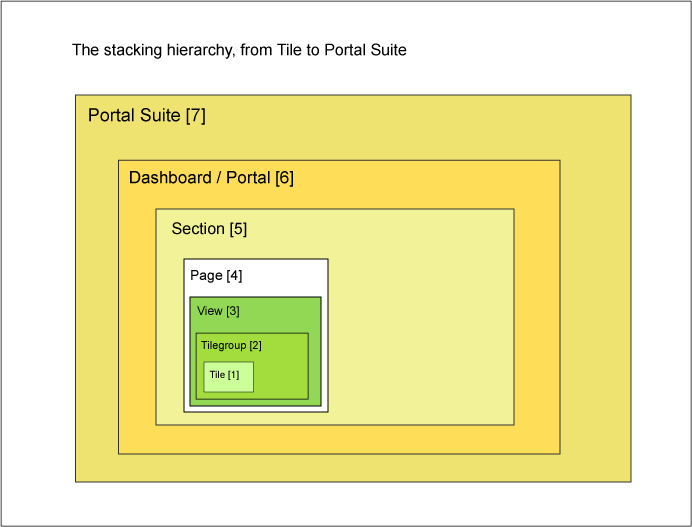 In this role, Pages become the delivery vehicle for combinations of Containers and Connectors that allow users to work with content, and move through the dashboard or portal environment. Pages typically combine collections of Tiles, Tile Groups, and Views with a set of accompanying Connectors (Section Connectors, Page Connectors, Crosswalk Connectors, Geography Selectors, and Utility Navigation) to create a navigable user experience. Pages–following the principle of Openness–may include free-form content or navigation mechanisms. Common examples of free-form content include search functionality, global navigation, links to intranets and extranets, feedback forms for requesting new features, and branding elements. A Page can consist of a single Tile, or only free-form content, may or may not have a Page Header or Page Footer managed as building blocks assets, and might not be connected to or accessible from other areas of the Dashboard or Portal. For example, a Page dedicated to account administration functions might only be visible to members of the user group Account Administrators, who themselves cannot see other areas of the Dashboard or Portal, and thus would not require navigation connections to other Pages in the Dashboard or Portal. Figure 15 shows an example rendering of a Page. This wireframe shows the structure of a Page that mixes free-form content with building block content. The free-form elements appear in the form of a typical dashboard page header that contains a stock ticker and market summary, and a staff directory search box. Branding elements such as logos identifying the individual dashboard often appear as free-form content. The building block content includes a navigation cluster made of a Section Connector and a Page Connector, two stacked Tiles, and a View that contains two stacked Tile Groups (Tiles not shown). On this Page, the two independent Tiles and the View are stacked at the same level within the containing Page. The layout of this Page places the Tiles above the View to ensure they remain visible without scrolling, but this layout is not necessary by the rules of the building block system. The individual Tiles on this Page do not include either Control Bars or Footers. The View includes a Control Bar with two selectors. None of the blocks offers Convenience Functionality, though of course this is possible across all levels of the stacking hierarchy, and is commonly available for the Page itself. The Section is primarily an organizational building block, but it does have a mandatory component of at least a single Page; this is to define an explicit context for navigation, user role. Sections typically consist of collections of Pages related to a core conceptual element of the information architecture or mental model for the Dashboard or Portal. It is not uncommon to see broadly defined Sections such as “Products,” “Customers,” “Supply Chain,” or “Sales.” Deep or complex Sections offering a considerable number of Pages or a large amount of content commonly include summary style Pages that condense or introduce the full contents of the Section in an overview. Shallow sections offering few Pages often do not require a summary style Page. Figure 16 shows an example rendering of a Section. This site map style rendering shows a Section, titled Products, which contains five Pages that offer a variety of content related to the two types of Products produced and sold by a fictional company. The Section begins with a summary Page titled Products Overview. The four additional Pages are titled Branded Products, Product Focus, Co-Branded Products, and Co-brand Product Focus. The five pages contain a mixture of stacked Tiles, Tile Groups, and Views. The summary Page, titled Products Overview (P.3), offers the following: two stacked Tiles, Daily Sales (T.1) and Top 10 Products by Volume (T.12); and a stacked View, titled Products Sales Briefing (V.3). By personal preference, only the blocks stacked at the level of the Page–level 3–are individually identified on this map-style rendering; the Views and Tile Groups would obviously include further Tiles stacked within. I use this rendering convention to cut down on visual clutter in maps of large dashboards or portals. For your own renderings, feel free to itemize every stacked block at every level on the Page, or even list the dashboard or portal contents in simple outline fashion without pictures. Each stacked block in the rendering is identified by its Title, and a unique ID code or label, to allow synchronization with a master list of building blocks available across all dashboards. The numbered lines indicate that each Page includes a standard Page Connector, offering navigation between all the numbered Pages in the Section. The Dashboard or Portal is the largest single unit of meaning possible to assemble from stacked building blocks. A Dashboard or Portal must consist of at least one Section (itself made of at least a single Page). Dashboards or Portals typically consist of several connected Sections, assembled from connected Pages that contain a variety of stacked building blocks, combined with a smaller number of stand-alone Pages dedicated to utility functionality or administration. Most Dashboards or Portals rely on a variety of Connectors to link assembled building blocks into a cohesive and navigable whole. A Dashboard or Portal’s information architecture often aligns with a single mental model, or a small set of closely overlapping mental models, though this obviously depends on the needs and goals of the expected users. To most users of internal tools situated withing an enterprise, a Dashboard or Portal is the total set of Sections, Pages and other stacked building blocks their security and access privileges permit them to see and use when they visit a URL or some other user experience destination (note: for web-delivered Dashboards or Portals, it is common practice to create a URL and expose this address via an intranet or other internal gateway). Since each user has an individually determined and potentially different set of security and access rights to each possible Section, Tile, View, and Page, each user will likely see a different combination of Dashboard or Portal content that is tailored to his or her own needs. Serve a group of executives running a large organizational unit within an enterprise, such as Marketing, Manufacturing, or Information Technology. Provide a class of information resources giving insight across an enterprise, such as inventory monitoring, sales forecasting, financial reporting, and quality control assessment. Offer functionality in support of specific roles that entail responsibilities across the enterprise, such as regional directors, account managers, or human resources directors. I recommend labeling or branding these kinds of internally focused Dashboards or Portals clearly, to help communicate their contents and purpose to users and administrators who will likely have to work with many different tools and environments, and may easily suffer disorientation as a result. A simple title such as “Corporate Finance and Accounting Dashboard” can help distinguish one Dashboard or Portal in a Suite from another for busy users. I also recommend creating a log-in or destination page that orients users and confirms they are accessing the correct Dashboard or Portal to meet their needs. In more public and social settings, the patterns of architecture, usage, and design at this level of size and complexity naturally differ. Design note: Depending on the depth and complexity of the assets offered within any one Dashboard or Portal, it may make sense to create a separate Home Page that introduces the structure and contents of the Dashboard, and offers unique content. Home Pages in this style commonly provide trend charts with roll-ups of more granular metrics, score-card style visualizations that communicate status for major areas of interest, alerts that require business attention, and high-level summarizations of the more extensive information available deeper inside. Figure 17 shows an example rendering of a Dashboard. This sitemap style rendering shows a medium-sized Dashboard or Portal designed to meet the information and business functionality needs of a large enterprise with multiple operating units and business lines. In this context, the Dashboard provides cross-unit summaries of many important metrics for senior managers, and could even provide them business functionality to alter business processes, change supply chain structures, or revise finance and resource allocations. This Dashboard or Portal consists of a dedicated Home Page, and five major sections: Marketing, Finance, Products, Supply Chain, and Administration. The first four sections–S.1 through S.4–are linked via a Section Connector, offering direct navigation between these Sections. Each of these Sections includes a summary style Page. The Administration Section is not linked and navigable via the Section Connector: access to this Section would come via another path, generally direct URL entry or at the Dashboard or Portal log-in prompt (not shown). Within the major sections, all Pages are linked and navigable via Page Connectors. A Dashboard or Portal Suite consists of a group of stacked (though at this high level of structure, the construct is more akin to a collection of interlinks rather than hierarchically arranged) Dashboards or Portals sharing integrated content and common infrastructure. Stacking Dashboards or Portals as a Suite allows design and support teams to organize and manage distinct but related Dashboards or Portals as a single unit, and can help users by giving them quick and direct access to the collection of interconnected Dashboards or Portals. These Suites generally serve a diverse population of users who draw on a variety of business intelligence resources or other functionality to execute job functions at a variety of levels within the enterprise. The goals or purposes of the Dashboards or Portals in a Suite may vary dramatically; hence their individual content offerings will also vary dramatically. Users whose business needs or functions require them to work with single Dashboards or Portals in a Suite may not realize the commonalities underlying the various individual Dashboards or Portals they use. Users whose needs span multiple Dashboards or Portals in a Suite typically rely on a Dashboard or Portal Connector to move from one Dashboard or Portal to another within the Suite. From an enterprise level architectural or IT administrative viewpoint, the Dashboard or Portal Suite can become the connection point to other enterprise level systems, such as metadata registries and repositories, ERP and SCM applications, enterprise data stores, security and authentication platforms, intranets, extranets, etc. The Dashboard or Portal Suite is also a useful unit for enterprise level perspectives including IT portfolio management, business process management, strategic information management, and knowledge management. Figure 18 shows an example renderingof a Dashboard Suite. This sitemap style rendering shows an enterprise level Dashboard Suite made up of seven individual Dashboards that share assets. Five of the seven provide depth of content in major domains of a global enterprise: Supply Chain, Human Resources, Product Development, Knowledge Capital, and Finance. Each of these domain Dashboards has a distinct internal structure, with the individual Sections identified on this map. The remaining two Dashboards–Global Leadership and Regional Leadership–aggregate assets for presentation to the different levels of executive leadership within the enterprise. Within this scheme, the information architecture of the two leadership Dashboards is closely parallel, but the scope of the assets shown in each would differ; users of the Regional Leadership Dashboard would have a view of Finance assets for their individual regions, and not globally, as in the Global Leadership Dashboard. In this Suite, the five domain Dashboards are linked to the two Leadership Dashboards via a Dashboard Connector, meaning that each of these is navigable directly from the Leadership Dashboards. The Regional Leadership Dashboard is also linked to the Global Leadership Dashboard via another Dashboard Connector. Whether these Connectors allow two-way access is dependent on the individual access rights of the various Dashboard users. The Dashboard Connector here ensures that the members of the respective leadership teams can literally see what their colleagues see when discussing a course of action. The fourth installment of the series will define the Connector components in detail. This story continues the Introduction to Building Blocks Series. Part 1 of this series “The Challenge of Dashboards and Portals” discussed the difficulties of creating effective information architectures for portals, dashboards, and tile-based information environments using only flat portlets, and introduced the idea of a system of standardized building blocks that can effectively support growth in content, functionality, and users over time. In enterprise and other large scale social settings, using standardized components allows for the creation of a library of tiles that can be shared across communities of users. Part two now outlines the design principles underlying the building block system, and the simple guidelines for combining blocks together to create any type of tile-based environment. The building block system is a packaged toolkit that offers standardization across several layers of an information environment, including the information architecture, the user experience, the functionality, and the metadata. As a potential framework for standardization, it is most important to understand that the building blocks are inclusive rather than exclusive, and that they are neutral with regard to any specific software solution, vendor, package, programming language, system architecture, development platform, business rules, enterprise environment, or user experience design guidelines. Collaboration environments and solutions such as SharePoint, eRooms, etc. Social networking platforms such as Facebook, Myspace, etc. The building block system defines two types of information architecture components in detail – building blocks (or Containers), and navigation components (or Connectors) – as well as the supporting rules and guidelines that make it possible to assemble complex user experience architectures quickly and effectively. The block system is not a pre-packaged dashboard or portal design. Instead, it offers modular components you can rely on to work together and grow coherently as the pieces making up a finished dashboard or enterprise portal. Using the blocks will help focus design efforts on the important questions of what content to provide, how to present it to users, and how to manage it effectively. Basic principles and assumptions underlying the block system, and how it can complement other design approaches. 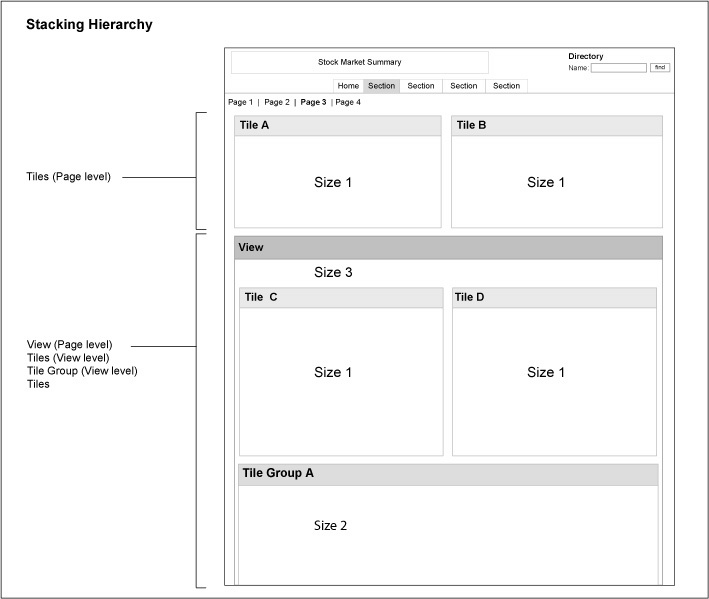 Assembly guidelines and stacking hierarchy which shows how to combine blocks into larger units while ensuring a sound and consistent information architecture. Standardized Convenience Functionality for blocks, which recommends a baseline set of common capabilities such as export of building block content, printing Tiles, etc. Common Utility Functionality which captures common productivity enhancements and capabilities linking the block-based system to other enterprise systems such as calendars and document repositories. Suggested metadata attributes for blocks that support administration and management needs, as well as important classes of utility functionality including alerting, syndication, searching, collaboration, and system administration. A few basic principles inform the design of the building block system and establish its boundaries with regards to other design systems or paradigms. In sum, they outline an open, flexible, well-structured, and internally consistent system. While the building blocks are independent of many constraints for where and how they may be put into effect, they will be most effective when a limited set of assumptions about the underlying environment are true. Those assumptions include the availability of authentication functionality to verify user identities, a role-based security framework that allows security permissions to be set at the level of individual blocks, a reasonably robust network that doesn’t require design for asynchronous use, and standard service levels for source application and system hosting and maintenance to ensure the steady availability of aggregated content and functionality. The building block system is open: using the building blocks does not mean that every piece of content must appear within a Tile (Tiles are the smallest building blocks, the de facto foundation level). In the same way that many sites supported by content management systems include considerable amounts of content that is not directly managed by the CMS, it is easy to mix block-based and free-form content in the same Dashboard or Portal, and even on the same Page. Mixing content may require you to give up some of the benefits of the building block system, depending on your platform and other infrastructure elements, but this is not sufficient reason to try and wedge everything into a poorly designed Tile. The building blocks support portability and syndication by design, under the assumption that individual building blocks or groups of blocks can and will appear outside their original context or in more than one context (if not immediately, then at some point in the future). With the right IT infrastructure and environment in place, it is possible to share defined blocks of all sizes amongst a suite of integrated dashboards/portals or other environments tailored to different audiences, or with other applications and systems. The structure, presentation, and attributes of the building blocks look ahead to the creation of a large library of assets that diverse consumers throughout the enterprise or in the broader community can use and reuse. Building blocks are wholly independent of one another, unless stacked together into a larger unit. 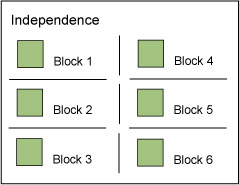 This means that while one block may offer controls or functionality that manipulate its contents, neither those controls nor that functionality will affect neighboring blocks unless the blocks are stacked together. The blocks follow a simple inheritance pattern, wherein nested blocks inherit the properties and behaviors of blocks with a higher stacking size stacked above them. (Keep in mind that the literal ‘size’ of a block – what kinds and how much content it can contain – is not determined by its stacking size. The purpose of the stacking size is to assist designers in creating experiences with consistent behavior and structure.) If a block at a higher level offers the ability to change its contents with a Control Bar, these changes affect all blocks stacked inside, cascading down from the highest level of the stack. If a block contains other blocks nested at several levels of the stacking hierarchy, and those blocks offer controls that change their contents, then changes affect all of the blocks nested within (or stacked below). 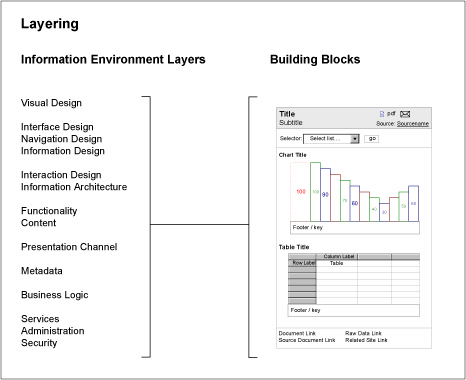 The building blocks work together as a coordinated system across multiple levels of the layer cake that comprises an information environment, from the user experience – visual design, information design, interaction design, information architecture – to functionality, metadata, business logic, and administration. It is possible to use the blocks to effect standardization at the level or layer of your choosing. For example, you could rely on just the presentation standards for identifying Container blocks to establish consistent screen layouts. Or you could put all the aspects of the block system into practice to drive the structure of a suite of integrated sites from top to bottom. The building block system relies on a small set of assembly guidelines and a size-based stacking hierarchy to ensure that it is easy to understand how to properly combine blocks together into larger units. The purpose of the guidelines and stacking hierarchy is to maintain the internal consistency of information architectures organized and managed via the building blocks. The hierarchy assigns each block a stacking size, ranging from one to seven, and specifies a few simple rules for stacking blocks of different sizes. To see if it is possible to stack blocks together, compare their stacking sizes in light of the rules below. Note: The Container blocks will be defined in detail in Part 3 of the series. This illustration shows the stacking hierarchy of the Container blocks, from the Tile – smallest, with a stacking size of 1 – to the Suite – largest, with a stacking size of 7. It is possible to stack blocks with a lower stacking size (“smaller” blocks) inside blocks with a higher stacking size (“larger” blocks). It is possible to stack several smaller blocks inside a larger block, for example placing three Tile Groups [size 2] inside a single View [size 3]. It is not possible to stack a larger size block inside a smaller block. This means you can stack several Tiles [size 1] inside a single Tile Group [size 2], but you can’t stack a Tile Group [size 2] inside a Tile [size 1]. It is possible to stack several sequential sizes of blocks together inside a single larger Container. This is the basic pattern for assembling a complex user experience. It is possible to skip a level of the stacking hierarchy when stacking several layers of blocks, for example by stacking Tiles [size 1] within a View [size 3], without placing them within a Tile Group [size 2]. It is possible to stack different sizes of blocks together at the same level inside a larger Container. As an example of the last three rules, a single Page [size 4] could include a View [size 3] and two Tiles [size 1] stacked at the same level. Inside the View are one Tile Group [size 2], with two Tiles [size 1] stacked inside the Tile Group, and two additional separate Tiles [size 1]. Thanks to these largely open system principles and flexible assembly guidelines, the building blocks can provide a lightweight skeleton that allows communities and groups of any size to create and use tile-based content and functionality within coordinated structures and processes, and then benefit from the network effects and social mechanisms that common structure and architecture makes possible. The building blocks can support all these social and network effects across the continuum of transparency and social involvement, from fully closed enterprises, to private and semi-public forums, to fully transparent or public contexts. In the near future, Part 3 of the series will define the building blocks in detail. This is Part One of our “Lessons From Failure”:http://www.boxesandarrows.com/view/lessons-from-failure Series. Several years ago, I changed careers, moving from designer to entrepreneur starting a dot com company. The experience taught me many lessons in the basics of how—and how not—to successfully build an Internet business. But the most valuable lesson I learned—one applicable to any business model, design challenge, technology, or industry—was in the powerful links connecting state of mind, self-definition, and failure. Startlingly, these same links appear no matter what size the group of people or the venture: from design projects and startup teams, to cultures seeding colonies abroad, state of mind and self definition are closely connected to how well a group responds to failure. In the midst of the exuberant rush to (re)create communities on the Internet for a dizzying array of peoples and purposes, we should understand and respect this underlying pattern, whatever our role: founder, designer, or member. For though the growing wave of technosocial media may change how we conceive of and relate to the Internet by offering abundant opportunities to create and join new societies, these societies will remain driven by fundamental elements of state of mind and self definition. To illustrate these ideas, I’ll briefly discuss three examples of new societies—the entrepreneurial ventures of their respective cultures—that faced failure: first, the small Internet company I founded, then two cultures facing environmental challenges. Two of these societies failed, and one succeeded. In the winter of 1999, I decided to start a business with two partners. I was working as an Internet strategy and design consultant at the time, so moving from designing online businesses for clients to designing one for myself felt like a natural step. We had a talented group of founders with the right mix of experience, and we had a good idea. We needed money in order to build substantial business and technology infrastructure, but capital for a good idea was easy to obtain in early 2000. Becoming an entrepreneur genuinely seemed like the thing to do at the time, since it offered a good opportunity to apply my skills and experience at a new level, and to my own vision. We worked diligently to build the company for the next twelve months. Our team grew from 3 people to 10 people in the U.S. and China. We recruited a (bad) CEO. We recruited a (good) CTO. We assembled an impressive roster of critical business partners and advisors on both continents. We were fortunate—given the terrible business climate for online companies after the dot com crash—to receive several funding offers from the very beginning. But none of them were sufficient, and some were downright shady (I met a number of “unusual” people during this time 1). In March of 2001, after a year of unpaid overtime, I left my regular full-time position to dedicate all of my time to the new company. In this, I was joined by several other team members. Based on our previous successes, we believed proper funding was literally around the corner. Our business plan was exquisite, our financial projections were meticulous, we had customers and staff in place, and our execution strategy was finely honed. Like a Broadway production awaiting the audience on opening night, we were ready to go. All we needed was capital. By the summer of 2001, despite considerable success during difficult times, we were at a financial breaking point. Lacking strong revenue, we could not continue without help from outside in the form of legitimate funding. The attacks of September 11th, 2001 shut down the New York capital markets, closing the door on any hope of venture funding shortly afterward. We closed up shop, my partners went their various ways, and I took another full-time position. After the team disbanded, I reflected on the experience to understand why we had failed. As a once and future entrepreneur, I interpreted these as straightforward lessons for my next venture: begin with an idea that is easy to understand, be flexible, don’t fear change, involve only trustworthy and talented people, make realistic financial assumptions about revenue and income etc. In summary, I understood that our failure was driven by the fact that we focused too much effort on securing external funding, and not enough on growing essential day to day operations. Vizzini would say our true blunder was that we did not get involved on the ground in Asia! People often ask why we made the decisions that took us from our first to our final steps. Why didn’t we change our plans? Why didn’t we put more effort into other ways to build infrastructure? I always answer, “It seemed like the thing to do at the time.” Meaning because of our state of mind and the progress we’d made, this course of action seemed the best way to reach our goal. We certainly didn’t intend to fail! In retrospect, it is clear our team shared a common state of mind that we were unwilling or unable to change. In this state of mind, underlying all the decisions we made from beginning to end was a single goal: seeking external funding was the best thing to do for the business. Based on our shared understanding, we pursued this goal far past the point when a heavily venture-funded model became invalid, because the environmental conditions that sustained it had collapsed. A glance at the headlines provides abundant examples of similar responses to failure driven by state of mind, such as the heated debate between the U.S. Congress and the Bush administration over different approaches to the ongoing U.S. involvement in Iraq. President Bush’s state of mind is epitomized by his dictum to “stay the course,” a view that substantially determines the choices considered possible by his administration. Some time ago, I came upon a quotation from an 8th century Buddhist philosopher named Shantideva that changed my perspective on my experience as an entrepreneur. In “Entering the Path of Enlightenment,” 2 Shantideva writes, “Whoever longs to rescue quickly both himself and others should practice the supreme mystery: exchange of self and other.” When Shantideva says, “exchange of self and other,” he is advising us to change our self-definition, one of the most basic components underlying state of mind. So I came to see that my team of entrepreneurs had set out on the wrong path from the beginning, and never wavered, because our state of mind rested on defining ourselves as venture funded entrepreneurs. We never considered changing our self-definition. Obtaining funding became part of our identity, rather than a pragmatic business activity. There is a second parallel with Shantideva’s words: we were unable to consider other courses of action even after we recognized that we were in danger of failing, because we were waiting for rescue from outside. We believed outside funding would save us. We never considered how our self-definition was leading us to failure. Nor did we consider that we might find another way to succeed if we changed our self-definition. President Bush would be proud: we managed to stay the course! Easter Island was settled approximately 1200 A.D. by Polynesians from islands further to the west. 4 The small (64 miles square) island remained essentially self-contained due to its remote location in the Pacific Ocean. 5 The population increased quickly as settlers rapidly cleared forests for farming. Based on common Polynesian religious practices, the Easter Islanders began carving the immense volcanic stone statues (Moai) that make the island famous, mysterious, and photogenic. Wood from the island’s forests was literally the fuel that kept this statue-making machine running. Farming to produce the food needed to feed large groups of workers required ever increasing amounts of cleared land. Moving statues required large wooden carriers and hundreds of miles of rope. Funerary rites mandated cremation and burial in the gigantic stone platforms. As Easter Island’s human and statue populations grew rapidly, estimates of the island’s forest coverage declined precipitously, as this comparison chart shows. The tragic pattern is clear to see: though institutionalized practices and goals based on a narrow self-definition were leading to comprehensive failure, the Easter Islanders refused (or were unable) to change their state of mind and goals, and their entire society collapsed. To this day, Easter Island is almost totally deforested, with the exception of small patches of trees from recent plantings, and the ~400 stone statues that remain. In a potent instance of irony, the Easter Islanders succeeded in constructing dramatic and enduring stone testaments to those things their society valued, even as the act of constructing those monuments consumed their society. President Bush would be proud of the Easter Islanders, too—they stayed the course. The Pacific island society of Tikopia is a good example of a culture that successfully responded to failure, by changing how its members define themselves. Tikopia differs from Easter Island in ways that make the challenges its inhabitants faced more pressing. Tikopia has been inhabited far longer (since ~900 B.C. ), is much smaller (only 1.8 miles square), has fewer natural resources, and supports a much higher population density than Easter Island. 11 Yet photographs of Tikopia today show a lush, green landscape that is well-forested, while the island is populated by closely spaced communities of villages, supported by well-tended gardens and farm fields. Over the history of human habitation on Tikopia, three different economic and social models governed the production of food and management of the island’s environment. For the first 100 years of habitation, the Tikopians relied on a slash and burn style agricultural model that severely damaged their environment through deforestation. They also mined the nearby shellfish and bird colonies for needed protein. Recognizing that this model was unsustainable on a tiny island, the Tikopians changed agriculture and food production practices to a mix of forest orchards and pig farming, wherein livestock made up ~50% of their protein sources. This new model retained a two-tiered social structure, allocating scarce protein to a ruling class of chiefs. Under the forest garden model, Tikopia’s environment continued to degrade, albeit more slowly than before. The dramatic changes in Tikopia’s social and economic model dating from ~1600 equate to a concerted shift of identity (self-definition) and state of mind for all of Tikopian society, a moment they commemorate to this day through oral storytelling. Unlike Easter Island, Tikopia’s society makes no distinction between the resources allocated to leaders and to the populace. Tikopian society does not reward environmentally destructive activity. The result is a stable population, kept carefully in balance for approximately 400 years by a range of practices that limit growth. All of these decisions were driven by a state of mind based on matching human impact with the island’s limited resources for the entire society. Shantideva would surely say the Tikopians are remarkably flexible and resilient: instead of waiting for rescue, they averted failure (through environmental and social collapse) by redefining themselves not once, but twice. As an entrepreneur, I was one member of a small group making decisions about a single business venture which affected only our own lives. But as designers, architects, technologists, business owners, or anyone involved in building the new virtual societies emerging under the banner of social media, we have the power to affect many lives, by shaping self-definition and state of mind in a community from the very beginning. We can’t predict every situation a starting society will face. But we can assume that potential failure is one challenge that may arise. And so—based on these three examples of societies facing failure—it seems wise to heed Shantideva’s advice about the exchange of self and other, thereby making our efforts now a part of the solution to future unknown problems. We can do this by allowing for changes to self definition, and by encouraging awareness of, and reflection on, state of mind, whether in our own venture or when we design a society for others. 3 Diamond, Jared. Collapse: How Societies Choose to Fail or Succeed. Penguin Books: 2005. 4 Terry L. Hunt; Rethinking the Fall of Easter Island. 5 Easter Island is 1,400 miles from its nearest neighbor (tiny Pitcairn Island), and 2,500 miles from the nearest large land mass, Chile. 6 Competing clans and chiefs received social status and rewards, such as farmland and food resources, from the successful construction of more and larger statues, giving them clear incentives to continue carving and erecting Moai. In effect, Easter Island’s cultural / political / economic system was built around an unusual positive feedback loop, in which more statues for a clan meant more people and more power, which meant more statues, which meant more people and more power… Similar carving traditions exist among other societies elsewhere in Polynesia, but on much smaller scales. 7 A recent count shows 300 platform and burial sites (ahu) around the island, with approximately 400 statues. There are 300 tons of stone in a small ahu, and 10,000 tons of stone in the largest. The average moai is 13 feet tall and weighs 10 tons, the larger moai reach up to 32 feet tall and weigh 75 tons. Another 400 moai sit partly completed in quarries, reaching heights of up to 75 feet tall, and weighing 270 tons.